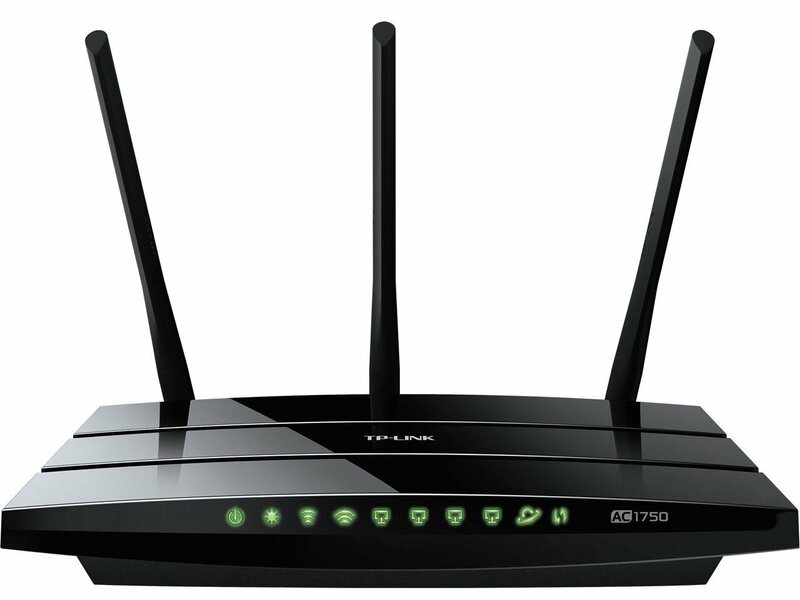 As far as consumer routers go, the TP-LINK Archer C7 AC1750 Dual Band Wireless AC Gigabit Router, 2.4GHz 450Mbps+5Ghz 1300Mbps, 2 USB Port, IPv6 is a pretty standard router offering a couple of nice extras that are, generally, not found inn most routers. On its back panel, it has 4-gigabit Ethernet ports, accompanied with a WAN port that makes it suitable for use with the newer class of modems. This router also supports IPv4 and IPv6 protocols, which make it a bit future proof, and a standard AC adapter/wall wart combination for power. Also, the Archer C7 AC1750 has a dedicated wireless on/off switch, which is very useful, seeing that most routers do not have these. These switches allow you to disable wireless and/or perform a cold reboot of the router independently, without having to unplug it from the AC jack. On its front panel, this router from TP-LINK sports a pretty typical modern display. It would have been cooler should its Ethernet lights have different colors to indicate 10/100/1000Base-T connections. However, this is probably just us, users, wishing to see more information at a glance. When you use a USB slot to set up a print server, take note though that the Archer C7 AC1750 wants you to download or print details about its print-manager software. This means that, with a little frustration, you would get the device working on all devices except for Ipads, which seem to be not supported just as yet. However, this can be dealt with fixes if you are computer-savvy or if there are solutions (which are probably on the way) in the future. You can get warranty information about this product by clicking here. Based on its innovative capabilities, the TP-LINK Archer C7 AC1750 Dual Band Wireless AC Gigabit Router, 2.4GHz 450Mbps+5Ghz 1300Mbps, 2 USB Port, IPv6 is surely an equipment to invest in for your personal or business purposes.